More privileged than the nearby Thai or Balinese destinations, the island of Palawan has luxury hotel offerings. Lagoons, preserved marine sanctuary, beaches… Experience made even more unique in the northern part of the archipelago, specifically on Lagen and Pangulasian Islands, where El Nido Resorts edges a series of eco-sanctuaries perfect for a trendy honeymoon. New destination for Vogue this summer, the Philippines and the island of Palawan begin to increase the desires of the adventures in quest of turquoise lagoons. The luxury resorts nestle in the northern part of this island. Pangulasian Island is the pearl of these four hotels. Arriving guests get surprised as their boat approaches the island with its 42 deluxe villas are hidden behind a pristine tropical forest. This eco-friendly sanctuary perfectly preserved by El Nido Resorts is bordered by 750 meters of beach with fine white sand. Private swimming pools overlooking the ocean, Canopy rooms with breathtaking views, hiking trail where you can admire the sunrise and sunset, marine sanctuary to explore, customized excursions, spa and a night boat ride for a private dinner on a secluded island… truly a hideaway that is private and unique. during the recently concluded 2017 Travelers’ Choice Awards. Travelers’ Choice awards are the highest honor TripAdvisor can bestow. Based on millions of reviews and opinions from travelers around the world, these annual awards reflect “the best of the best” for service, quality, and customer satisfaction, from hotels and accommodations to destinations, attractions, and even brands and products. 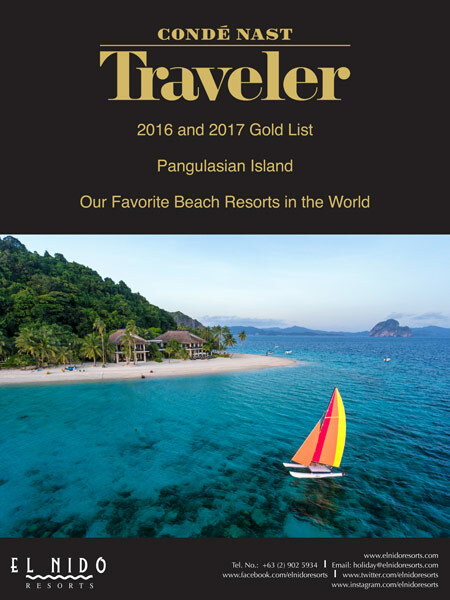 We are delighted to announce that Pangulasian Island was recognized in Condé Nast Traveler ’s 2017 Gold List: Our Favorite Beach Resorts in the World. 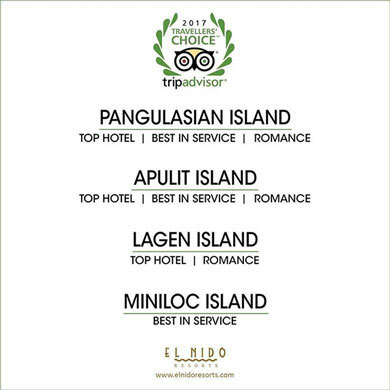 Pangulasian Island is the only Philippine-based resort which made it to the Gold List for two consecutive years.